Thank you to Mr. Sheldon Wert for information for this page. Please contact us with additions or corrections. The name Shelard Park denotes several things: a neighborhood, a subdivision, an office complex, a City park. It is the idiosyncratic piece of land that lies north and west of the intersection of Highways 169 and 394. Shelard Park occupies 109.6 acres (3 blocks residential). Parks and open space – 6.3 percent; Commercial/industrial -33.9 percent. Shelard Park has 809 housing units (308 condominiums and 501 apartment units). Population – 1,559 (2002 Census). 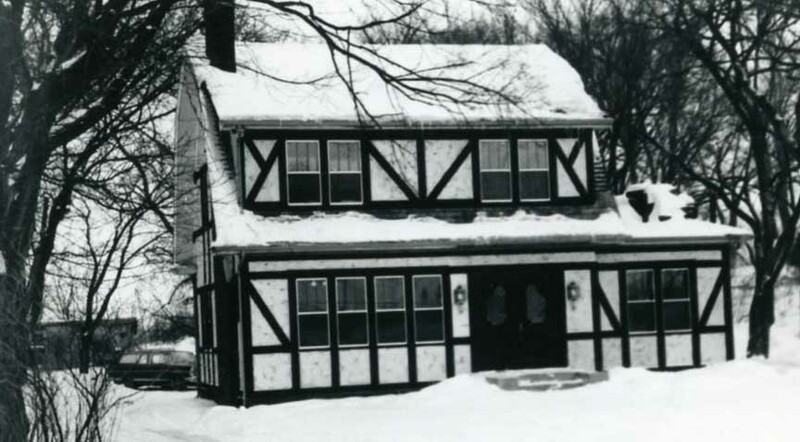 The Shelard Park neighborhood was annexed by St. Louis Park from Minnetonka in 1955. It was originally planned to be a shopping center, but plans fell through. The force behind the original annexation was Wallace E. Freeman, whose family owned Freeman’s Department Store at 2700 E. Lake Street from 1917 to 1975. At the time (in the ’50s) Freeman owned just a small part of the parcel, but apparently bought up the rest, as he hired a contract farmer to grow corn on 80-90 acres during the ’60s. 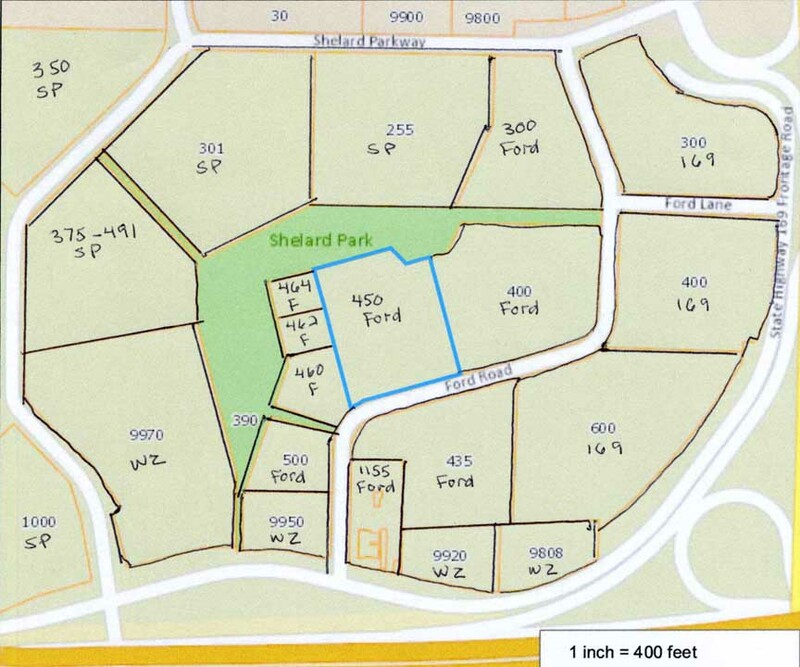 Shelard is a difficult area to describe, because it is basically a series of buildings that are inside a loop consisting of Ford Road and Shelard Parkway. The land for the Shelard Park office building project was purchased from the Freemans by the Shelard Development Co., named for partners Sheldon Wert and Richard Leary. The company put in the infrastructure and submitted the plat for Shelard Park subdivision, which was filed on October 9, 1969. The Shelard Development company then sold the land to four different entities that would built the office towers. Sheldon Wert was also part of those companies, but eventually parted ways with Richard Leary. Robert Liesen, an associate of Leary’s, participated for a few years but had no equity in the company. The project was part of a Planned Unit Development (PUD), and the developers worked closely with the City to define the plan, which changed during the process. Mr. Wert said that he never missed a City Council meeting in ten years, and had an especially good relationship with City planner Bill Thibault. One aspect of the plan that changed during the process was a 27-story apartment building with 1,500 apartments! The four-building office complex was built between 1970 and 1982. The architect for all of the office buildings was James Cooperman. All of the buildings and ramps are built with pilings down to bedrock. In 2012 the complex (by then called Metropoint) was owned by BPG Properties, Ltd. and managed by Cushman & Wakefield. The following are the individual buildings of the complex, identified as they are on the management company’s web site. 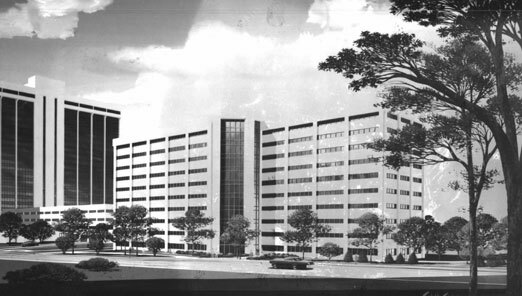 BUILDING 400 (400 Highway 169 South): The first component of the complex was the 8-story Shelard Park Office Building, opened on February 1, 1971. It was built by the Shelard Development Co. and sold to the Equitable Life Insurance Co. The Shelard National Bank was located on the first floor of this building. Attached to the 400 Building (on the walkway between the 400 Building and the Tower) was the Hippogriff Restaurant, which later became Paulines. Click Here for a page on that famous Twin Cities music venue. BUILDING 600 (600 Highway 169 South): First called Shelard Tower, this building of 21 stories reached its full height in November 1974, to be occupied in October 1975. The building cost $17 million. 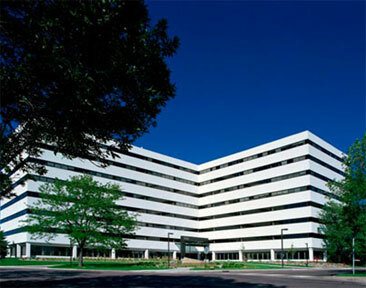 The complex also includes a 1500-stall, 5-story parking ramp, which may have been the first suburban parking ramp built in Minnesota. The building was built by the Shelard Development Co. and sold to the Equitable Life Insurance Co.
THEATER The General Cinemas Shelard Park movie theater was attached to the lobby of the Tower and extended into the parking ramp. In 1975 a fire ripped through the theater, causing $100,000 in damage. Fire departments from Golden Valley and Edina were called in. The damage was repaired quickly, for in the same year, the three screen theater opened with “Breakout,” “Young Frankenstein,” and “Shampoo.” The theater eventually expanded to five screens; General Manager was Scott Denfield. The theater operated until September 2000. The current Willow Creek 12 Theater is located at 9900 Shelard Parkway in Plymouth. The complex would eventually encompass 109.6 acres when completed in 1986. BUILDING 300 (300 Highway 169 South): This 8-story office building was completed in 1979. It was built by the Shelard Development Co. and sold to the Equitable Life Insurance Co.
BUILDING 435 (435 Ford Road): This 10-story office building was completed in 1982. Its legal address is 400 Ford Road. 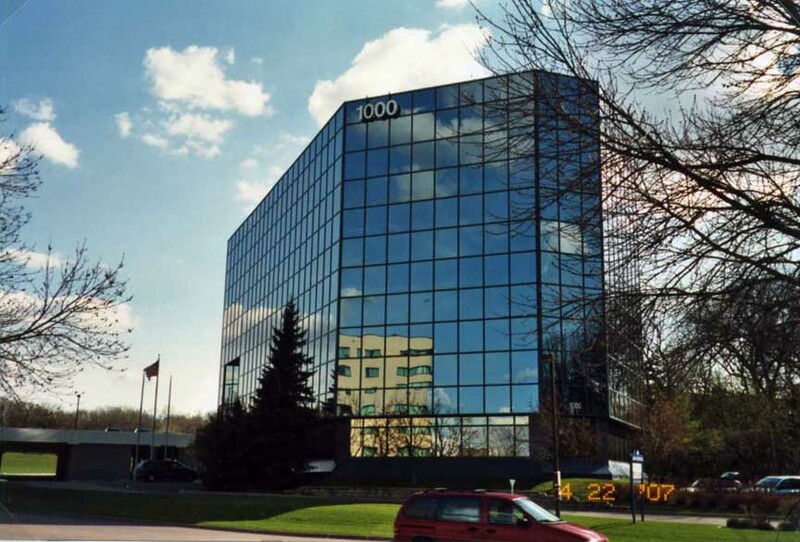 Unlike the others, this building was specifically built for the Equitable Life Insurance Co.
9604 Wayzata Blvd. belonged to Harold and Fred Johnson in 1955. 9708 Wayzata Blvd. 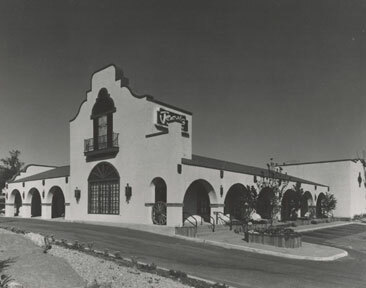 housed the Peterson Russell Greenhouses in 1955. 9808 Wayzata Blvd. was a house that had been moved in from Minnetonka Blvd. by H.M. Cornish in 1955. In December 1959 Ruth A. Cornish received a permit to mine clay and gravel at this address. In 1960 it was a house with an animal pen in the back. 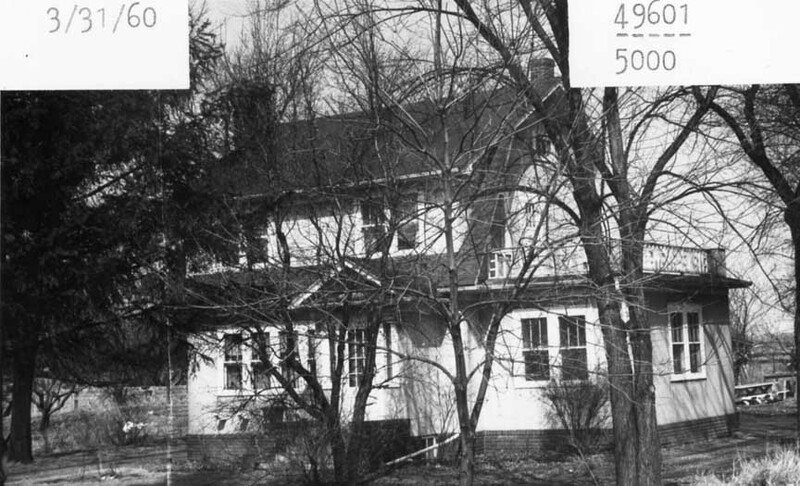 By 1969 the house had been “Tudorized.” In 1976 owner George C. Gubbins, Jr. sold it to Restaurants No Limit, which used it as an office until 1984. 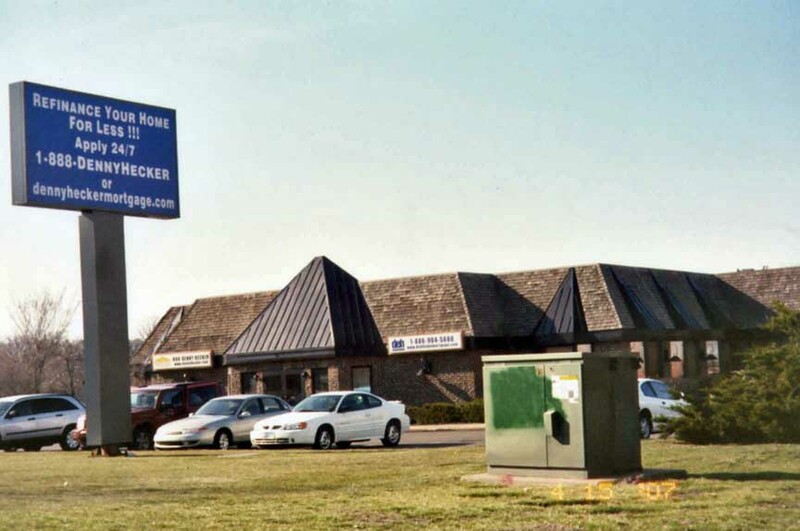 Restaurants No Limit was owned by Bill Naegele, son of Robert O. Naegele, Sr. of Naegele Outdoor Advertising Co. The father started the restaurant business when he bought Lord Fletcher’s. Son Bill Naegele took over that restaurant and eventually expanded to own Prachna on Main and Herman’s 1890 in SE Minneapolis; Lord Fletchers, the Beanery Cafe, and B. Flanagan’s Bar in Spring Park; D.B. Searle’s in St. Cloud; and Forepaugh’s in St. Paul. By 2007 the house had been torn down, except for the garage, which was in the corner of what was Santorini’s parking lot. In 1953 it was the address of the Merry Hill Kennel, run by the DeMuth family. The DeMuths were village dog catchers for a time. 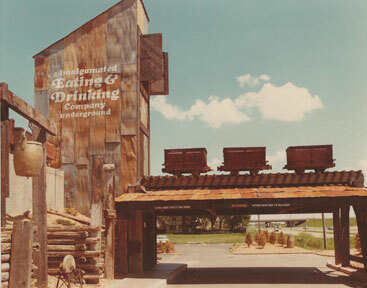 With the development of Shelard Park, Restaurants No Limit, owned by Bill Naegele, broke ground for the Amalgamated Eating and Drinking Co. in August 1973. 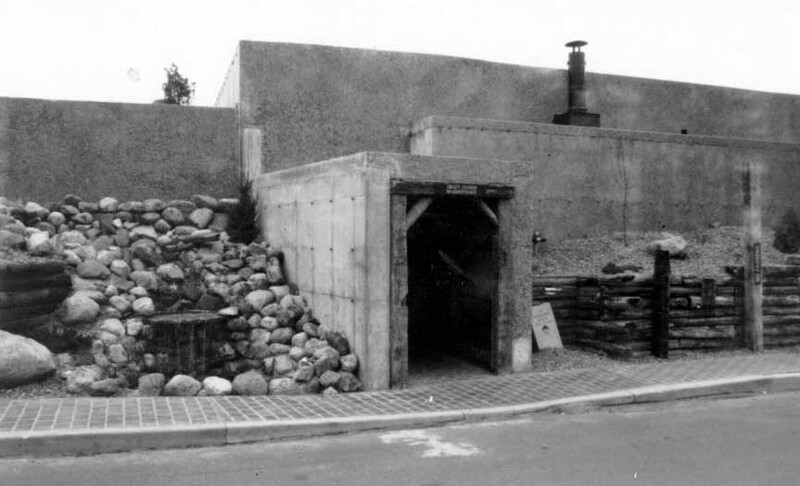 Naegele made great efforts to make the mining-themed restaurant authentic – he took a trip to Tower Soudan, in mining country, where he met a miner named Skybo Thomas. Thomas put him in touch with other miners, and Naegle got ideas for menu items, took photos, and obtained some ore cars and track. He also bought out the artifacts of a gold mining museum in South Dakota, including a swing seat used to do maintenance work at Mount Rushmore. One of the highlights of the Amalgamated was the “elevator” door where a guest would walk in and the walls would shake and pulleys move as if it was a real elevator. The door would then open on the other side into the restaurant. In 1978 it was apparently the Amalgamated Underground, with “Appropriate Entertainment” (this was in a High School program). “Home of the Famous Fried Ice Cream.” The Amalgamated operated until 1979. 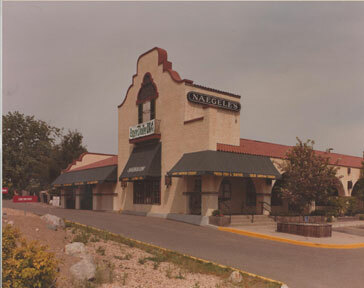 In 1980 Naegele redecorated the inside of the Amalgamated and made it into a Mexican restaurant called Jose’s. The idea came when Chi Chi’s approached him about opening one of their restaurants at the site. There were three distinct areas in the restaurant: The Roadhouse had a 1930s theme, with Naegele Outdoor Advertising memorabilia as decor. The Southwest Grill featured food grilled over mesquite and featured harp music. The Burma Shave bar was billed as “an evening gathering spot where you can work up a lather and cme out smooth. .. designed to the thme of the thirties and the road, offers dancing, chancing, beverages and food to the wee small hours.” Burma Shave had a ’50s theme with waitresses on roller skates. 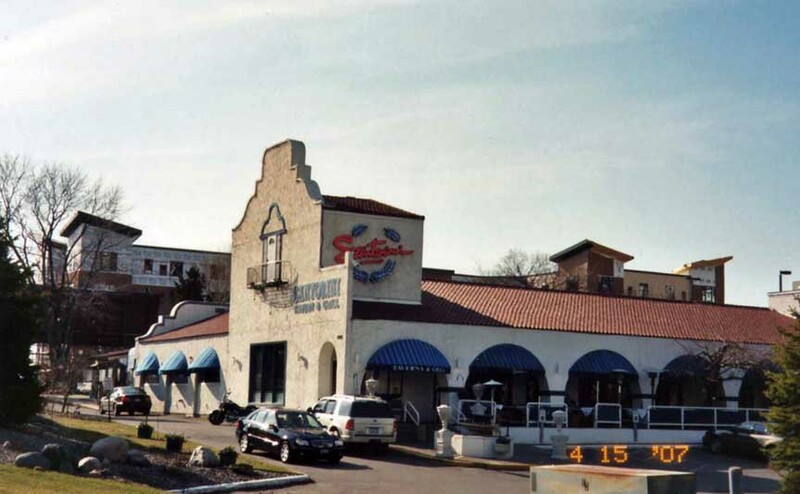 The restaurant was hurt by the construction of I-394 – whereas it had been easily accessible from Highway 12, now it could be seen from the freeway but patrons really had to know how to get there from the correct exit. An undated matchbook tells us that at one time it was Edward’s Restaurant and Bakery. Edward was Edward Christie. Polo was run by Chris Coyer. At one time it was Italian and then a sports bar. During the construction of I-394 they ran into financial difficulty and started overcharging peoples’ credit cards, leading to a conviction for fraud. One patron reports that he was billed $25 (the correct amount) on his credit card the night of his visit, but when he got his bill there was an additional charge of $2,500 the next day! He got it reversed, but Polo was in a lot of trouble. The Nicklows first rented the building from Naegele and then bought it 2007 for $1.8 million. Mn/DOT condemned some of the property in June 2003. Santorini moved to Eden Prairie in 2009 and the building stood empty for years. The building was severely vandalized and the owners and the city went through some legal wrangling before the Nicklows had it demolished on January 23, 2013. Read Seth Rowe’s story in the SLP Sun Sailor from February 7, 2013. 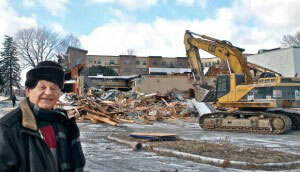 Co-owner Tony Nicklow at demolition (photo from SLP Sun Sailor). Nicklow marked the demolition with a toast of Greek ouzo and a party bus. Facilities included 8 courts (one glass exhibition court), a nursery, walk-in whirlpool, sauna and lounge. The ad also announced a National Racquetball Invitational Singles Tournament, featuring the Nation’s Top 16 players. Tax records indicate that new condos were built on this site in 2007. 9950 Wayzata Blvd. is an office building built in 1979. An October 1982 ad said it was the second anniversary of Benjamin’s Restaurant and Bakery (with another location at 13050 Aldrich Ave. So. in Burnsville). In 2007 it was (one of) Denny Hecker’s offices. In 2011 it was purchased by Martha O’Hara Interiors. 9970 Wayzata Blvd. 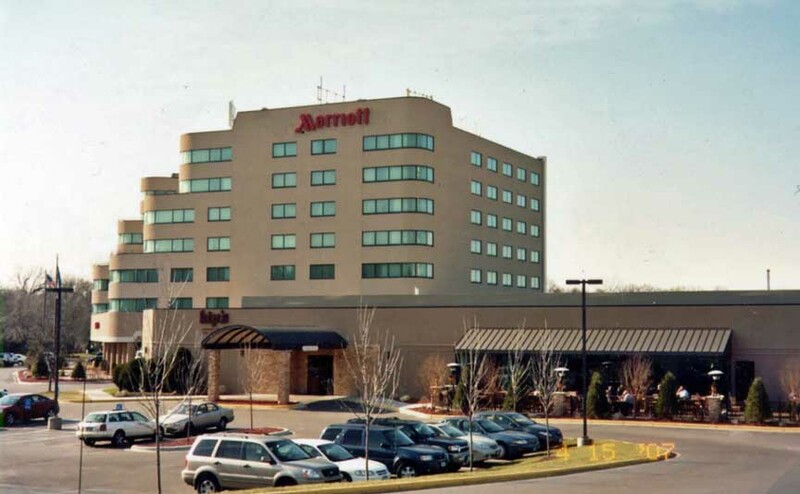 is the Minneapolis Marriott West Hotel, built in 1986. 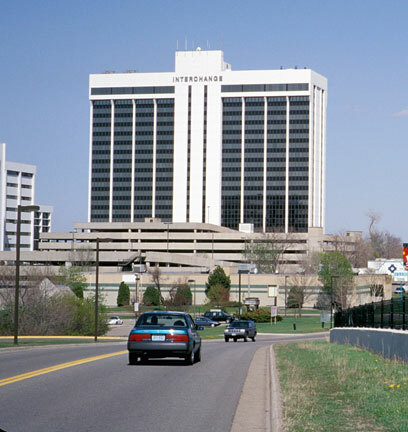 1000 Shelard Parkway: Six floor office building called Superior Plaza, built in 1985. Home to Bell Mortgage “Since 1880.” David C. Bell was active in the formation of several companies in Minneapolis. A 1956 story says that the company was wholly owned by its employees. 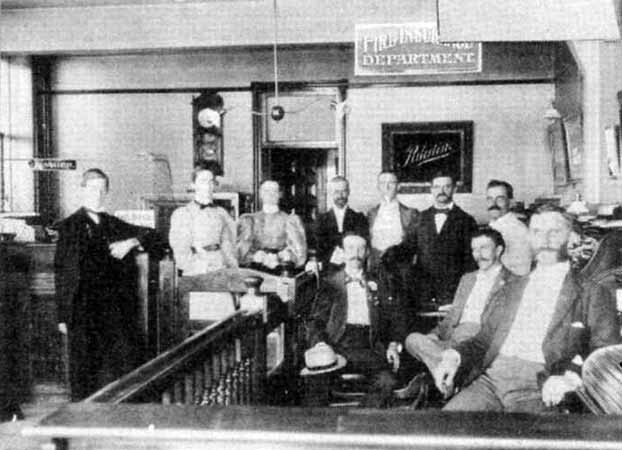 At that time company offices were at 501 Second Ave. So., downtown; and 15906 Wayzata Blvd., Minnetonka.